Have You Seen Our New Fort? is a perfectly befitting title for Hezekiah Jones’ latest full-length. It exudes with child-like enthusiasm and pride in what mastermind Raph Cutrufello had built in the studio with the help of his music community friends, especially producer Andrew Lipke. Well, that’s just my interpretation, but Cutrufello enjoys that about making his art. He wants people to have their own interpretations of what he created. Opener “Airplane Window” gives us a view into how different this album might be from his past material. “Folk songs for the end of world” have found some upbeat pop full of horns and harmonies and quite possibly hope for living. It’s followed by the record’s first single “Mind Malaise” which is a journey into reggae grooves with jazz horn bursts. Its drops into the choruses from the verses are silky smooth transitions. 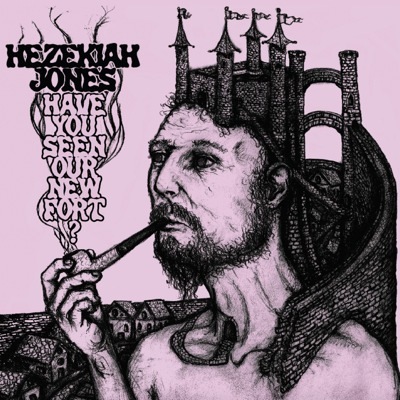 “Some Things to Help You” is an extended jam from the outtro of “Mind Malaise” that gets more psychedelic than I’ve probably ever heard from Hezekiah Jones. It was most likely inspired by the numerous hours Cutrufello and Lipke spent experimenting and tweaking in the studio. Carried over from his last EP Bread of Teeth, “I Love My Family” is vintage Hezekiah Jones with its earnest vocals and beautiful, heartfelt lyrics. “Drawing Pictures” has an upbeat, pop bounce while Chris Bathgate’s “The Last Parade on Ann St.” is a soothing cover that pays homage to a songwriter Curtrufello so admires and respects. “Dean Healm” and “Cannonball (I’ve Got a Little Room)” feel like military waltzes before heading off to war. The latter also appears on his split EP The Ashville Squints with Chris Bathgate. You can find little production nuances and experimental touches in “Lift the Shadow From the Heart” where it might have been recorded simply with Cutrefullo’s vocals and guitar earlier on in his career. Album closer “Traffic to the Sea” is a pretty ending and has Beatles-esque influences all over it from its horn arrangements to McCartney-like piano and vocal melodies.